Good evening all. I’m writing this too you while I sit in my sewing space waiting for my hair to turn purple. Actually a variety of colors. Radiant Orchid, Fuchsia and Magenta to be exact. I’m coloring my tips all by myself. Not sure how it will turn out, but I figure I can always put it up in a bun while I wait for it to fade out. I love the colors though. Sooo pretty. Okay, onto my sewing part of the post. In my opening post for this blog I explained that I wanted to create my own wardrobe that would be made to my custom measurements and be what ever I want. I plan to make some basics, kind of like a capsule wardrobe, but of course there shall be stand out pieces as well. But to accomplish all that I need to first create my one of a kind pattern blocks that I can begin with for every piece. This makes things accurate and so much faster when I don’t have to start from scratch every time. 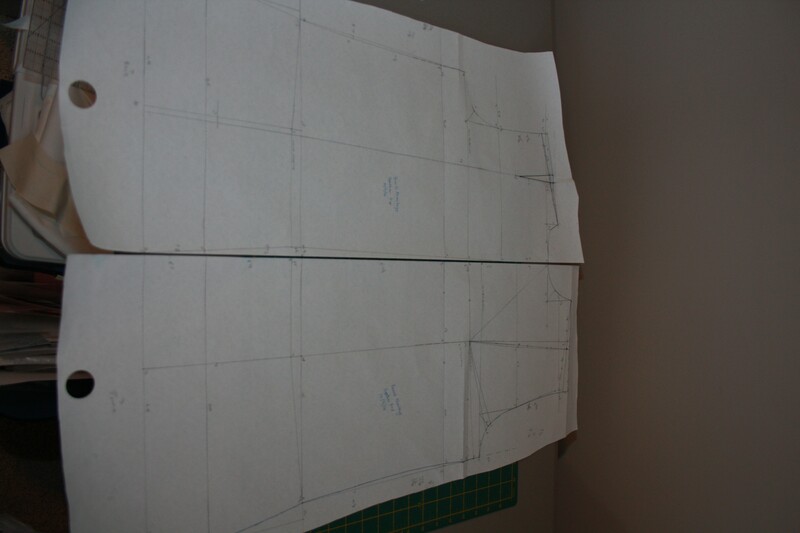 My goal is to create a moulage, a bodice sloper, pants sloper, a skirt sloper, and a dress sloper. From these I can pretty much make anything with the right tweeks. I already have the moulage version 1 drafted and muslin created. Now I just have to make alterations where needed. And of course there are a lot needed. You can go through several different versions before the perfect fit happens. A moulage, for those that don’t know, is sort of like a bodice sloper, but it is skin tight. Absolutely no ease. And I’m telling you that when I put mine on I feel like I’m choking and I want to rip it off because I feel so claustrophobic. I shall show you a picture, but I got to say I feel so awkward, cause it shows every flaw. Of course it does it’s like a cloth skin. Kind of creepy imagery I know. Anyways, no judgement please. So now you can see that I still have a lot of alterations to make and as I make them I’ll make sure to post the updates. Until then let me show you where I started. This is a picture I my moulage pattern block. I’ll make my changes first here on the pattern then I’ll copy it to another piece of paper before cutting it out to use to cut my fabric out. 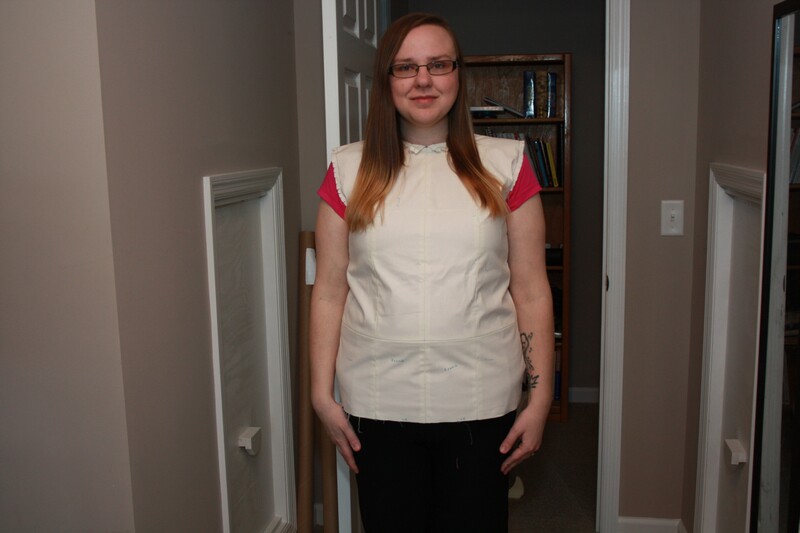 Then I’ll make another muslin and do another fitting. I’m not sure how long this will take me. Especially since my girls are constantly vying for my attention, but I shall do my best. I hope you will all cheer me on. Once I do get this pattern perfect I will transfer it onto tag so that it will become a lot more resilient to wear and tear as I will be using it a lot. As of now it is just on butcher paper. Okay well that is all for now. My alarm just went off and I need to go wash out my hair before I end up bald. Not sure if it would actually do that or not, but it wouldn’t be a pretty sight. Here’s hoping I my hair looks good. Wish me luck!